This beautiful seven-drawer dresser is crafted with olive ash burl veneer mixed with flaky oak veneer for a warm, traditional look. Lavish details such applied carvings, large mouldings, and gold-tipped hardware enhance the visual elegance. Larger bottom drawers are perfect for storing clothing, while smaller top drawers protect your jewelry and accessories. 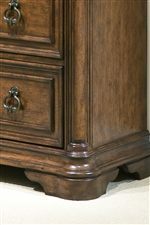 Add this dresser to your bedroom furnishings to create a charming traditional home. The Romantic Dreams Traditional 7-Drawer Dresser with Gold-Tipped Hardware by Vaughan Furniture at AHFA in the area. Product availability may vary. Contact us for the most current availability on this product. Romantic Dreams is an enchanting traditional bedroom collection. Olive ash burl veneer and flaky oak veneer come together in a selection of warm, elegant pieces you will love. 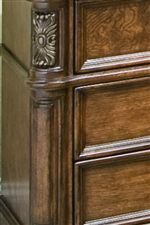 Deep mouldings and lavish applied carvings adorn every piece in this collection, giving a hearty nod to traditional European design. The centerpiece of the the bedroom suite, a gorgeously styled sleigh bed showcases a tall arched headboard complete with bold overlays and whorled carvings. Storage and accent pieces echo these design characteristics, resulting in a bedroom collection as timeless as it is nostalgic, bringing ample beauty and finesse to your home furnishings. 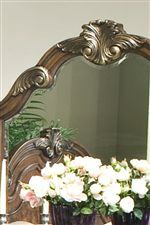 The Romantic Dreams collection is a great option if you are looking for Traditional furniture in the area. Browse other items in the Romantic Dreams collection from AHFA in the area.